STORRS, Conn - Boston College's Julius Mattila finished with a hat trick and goaltender Joseph Woll stopped all 30 UConn shots as the Huskies were shutout Thursday night at the XL Center, 4-0, in the opening game of a Hockey East series. The Huskies dropped their sixth-straight game and fall to 5-10-1 overall and 2-8-1 in the league with the loss. BC improved to 5-6-2 and moved to 5-1-2 in Hockey East. Mattila scored what proved to be the game-winner at 14:53 in the first period. His second came in the second period as part of the Eagles going 2-for-2 on the power play in the period. The junior capped off his hat trick late in the third, scoring on the empty net, shorthanded, to seal a 4-0 BC win. UConn held a 30-27 edge on shots but came up empty on their two power play chances. Junior goaltender Adam Huska (Zvolen, Slovakia) stopped 23 shots in taking the loss. BC's Logan Hutsko scored the other Boston College goal. Woll stopped 14 shots in the first period and then 11 in the third to keep the Huskies off the board. The Eagles struck for the game's first goal of the night at 14:53, coming on a 4-on-4 after a pair of penalties at the 14:04 mark. Mattila picked-up his first goal of the night and his fourth of the season after taking a feed from Cotton to get behind the defense and in on Huska, beating the netminder to the stick side with a slick move. The Huskies got an early power play chance in the second period but came up empty as the Eagles ran their lead to 3-0 thanks to a pair of power play goals. Hutsko made it 2-0 at 7:24 with his fourth of the season. Senior defenseman Casey Fitzgerald took a shot from the high point that was blocked but he collected the rebound, finding Hutsko deep in the left circle for a one-timer past Huska. The Eagles got their second power play chance at 16:07 and need just 35 seconds to make it 3-0. Cotton got free up the left wing and passed up a shot to feed Mattila at the far post who buried the one-timer for his second goal of the night. The Huskies twice pulled Huska in the third period looking for a spark with an extra skater, first on a 4-on-4 stretch at 11:20. The Huskies got their only power play chance at 15:27 on a tripping call and pulled Huska again to get a 6-on-4. 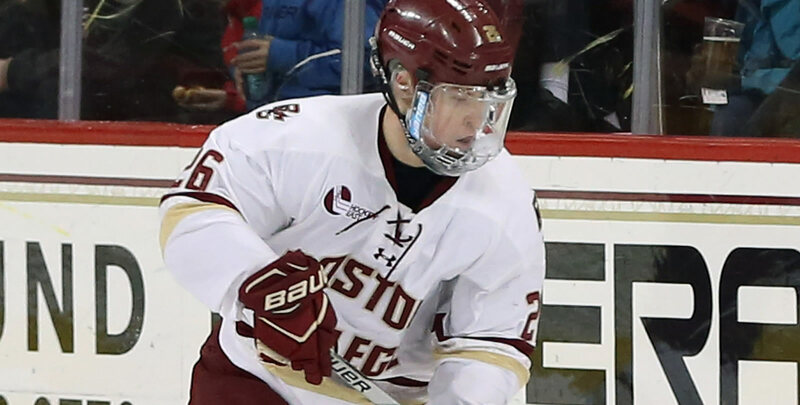 BC's Jack McBain took the puck in the neutral zone and fed Mattila up the ice for the empty netter. The Huskies and Eagles finis up their weekend series on Friday night from Kelley Rink in Chestnut Hill, Mass. Game time is set for 7 pm and the game is available on ESPN3.